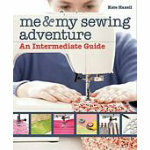 After learning the basics in Me My Sewing Machine, readers can now graduate to more sophisticated techniques in this followup book. With her characteristic clarity easy to follow instructions, the author guides readers through the challenges and nuances of professional finishes, fabric manipulation, specialty seams, pattern construction and much more. Once mastered, any sewing endeavor can be approached with confidence ease. Simple foolproof instructions and helpful pictures make it easy to learn challenging techniques. A 6 project bonus, puts the lessons to work. Published Feb 2014 128 pg color book with flaps 8.25"x10.25"